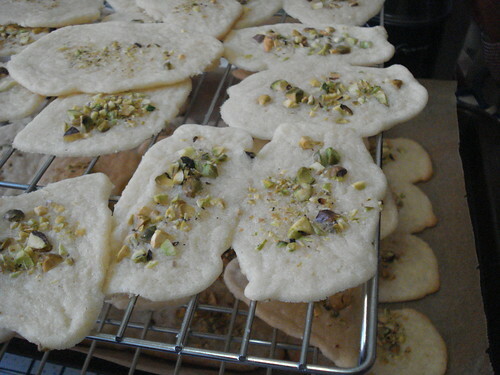 I made this recipe a few weeks ago, but have been too distracted by other things to get the post written and published. Nothing big, you understand, nothing dramatic. Just the effluvia of holidays and working and trying (and failing) to catch up with the million other things I have going on. I had a day free enough that I was able to go to Whole Foods to look for meat. (Whole Foods is a bit of a trek for me to get to, and it’s usually full of crazed people so I really have to psych myself up for the trip.) 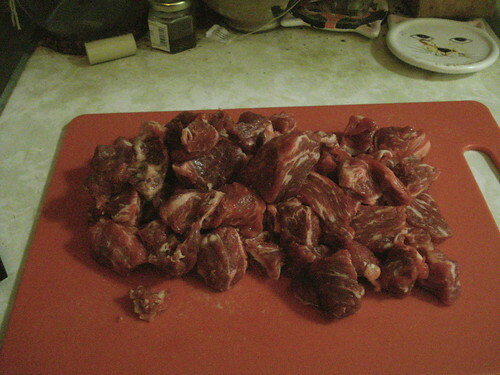 I was originally hoping for something to roast, but I saw that stew meat was on sale and I thought I’d make beef stew. 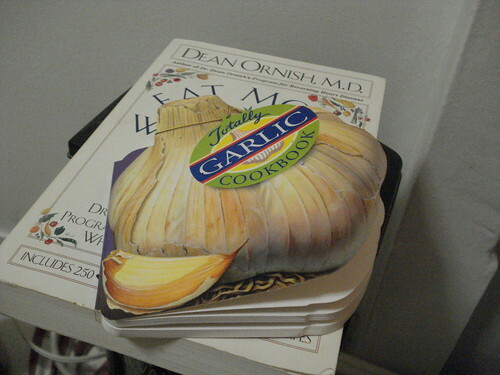 So after I got home I paged through the remaining cookbooks for promising recipes. 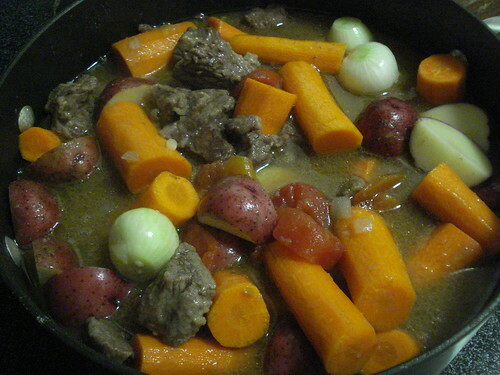 There were a few for beef carbonnade that looked good, but I opted for a more basic hearty beef stew with potatoes and carrots, and found a good recipe for that in the Cutco Cookbook. Cutco is a knife manufacturer based in Olean, NY; it’s been in business for about 50 years. The cookbook I have was published in 1956, and offers a lot of classically middle-American meat dishes: roasts, chops, stews, braises, grilled cuts, and “variety meats.” There are also illustrated guides for using the full range of Cutco knives — clear, professional illustrations — and then odd little cartoons throughout the recipes. 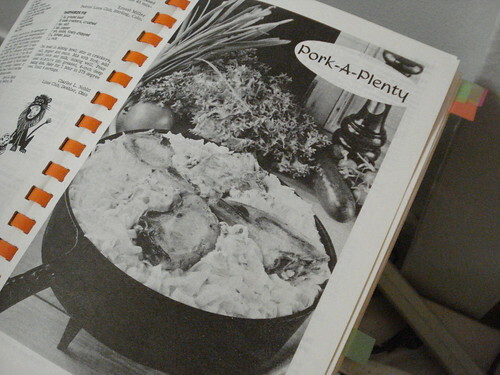 I got this book for Recipes of the Damned and wrote about brains, but many of the recipes outside the “variety meats” chapter seem fairly reasonable. 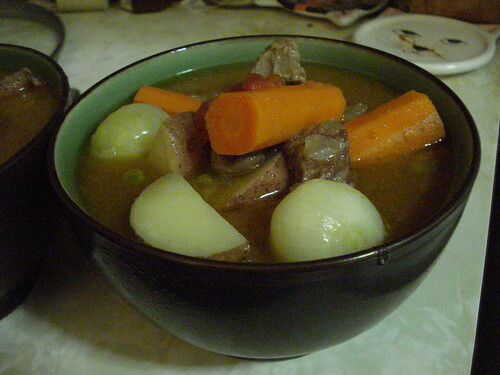 The beef stew was a straightforward affair. 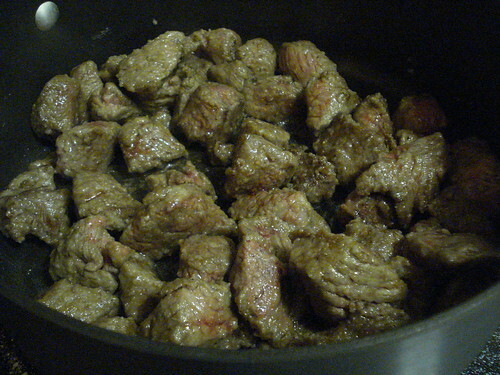 I cut the stew beef into smaller chunks, tossed it with some seasoned flour to coat, and browned it in hot vegetable oil. I then added some diced onion and garlic, sauteed that for a few minutes, and then poured in some boiling water and a can of diced tomatoes, plus a bit of salt and about half a teaspoon of worcestershire sauce. 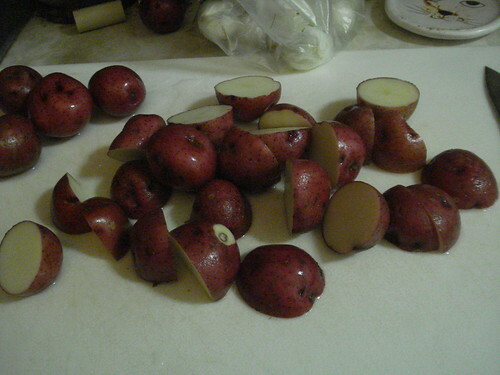 I covered the pot, brought the contents to a simmer, lowered the heat, and let it cook for about an hour and a half. 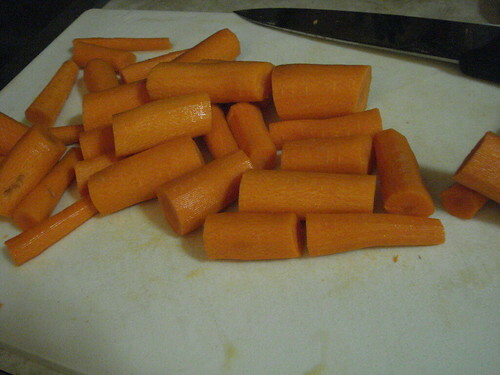 While it cooked I halved some small boiling potatoes, chopped some carrots into chunks, and peeled a dozen white pearl onions. When the timer went off I added those vegetables to the pot, covered it again, and let them cook 20 minutes; then I added 1 cup of frozen peas and let it cook another 15 minutes. And that was it. 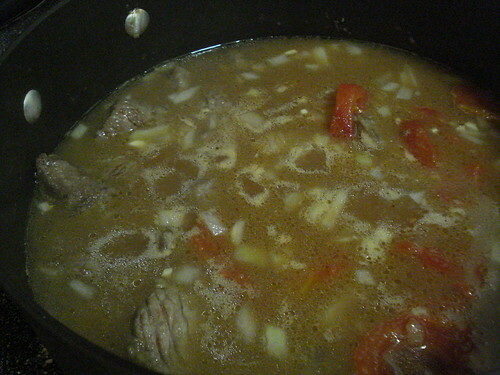 I wasn’t sure what to expect, but the stew tasted great: very hearty and simple, and the flavor of the beef was good. 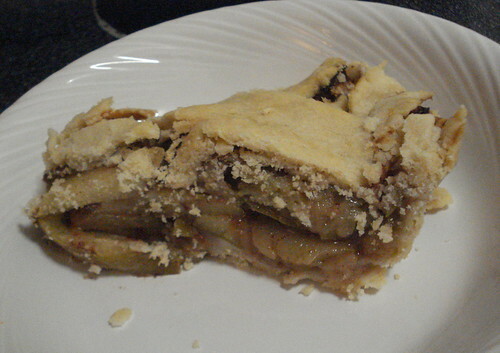 It was a nice meal for a chilly winter evening, and the leftovers were terrific reheated. Verdict: Success. So that’s one more cookbook off the list. 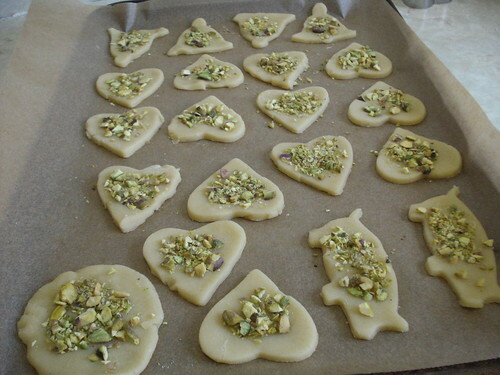 I’m going to have to bite the bullet and make some scary recipes in the coming weeks, if only so I can start trying other new recipes without feeling guilt about the project. 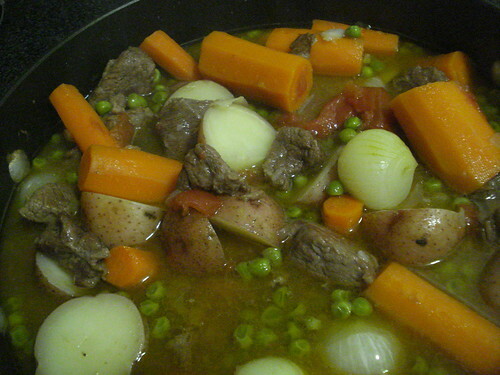 In the meantime, I may have to make some more of the beef stew. “Men don’t cook.” People tell me this all the time. That’s a load of bull. … we have better things to do. Why slave over a hot stove when we could be cooking up plans for a golf outing ? Or warming up at the gym? Or making things sizzle in the bedroom? 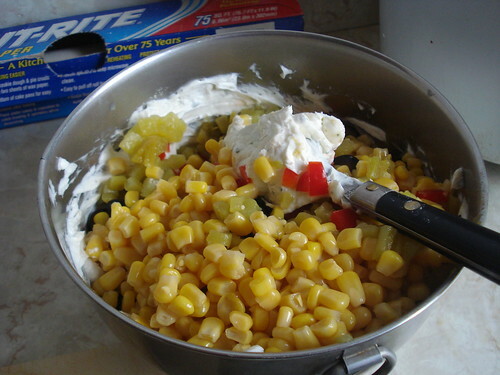 … When your girl insists that you cook something for a change, you’ve got it in the can. The book is published by Men’s Health, which clearly has very little faith in its readers’ ability to find their way around a kitchen without pictorial guidance. Or in their palates, for that matter; we find canned ham and pop-tube crescent rolls, tuna and jarred spaghetti sauce, Spaghetti-Os and — well, anything, really — and a truly disheartening array of canned soups. It looks like sponsorship must be involved too, because some brand-name products are featured in vivid color photos, while no-name ingredients get a textual “also” but no pictures. It didn’t take long to flip through the 50 recipes, but to actually settle on something I would make and ask other humans to eat took a while. I ruled out Spaghetti-Os, canned meat, and anything that would need to cook for more than 30 minutes on a 90-degree day. I also ruled out pineapple, canned fish, and beer as an ingredient. (I guessed that anything I was willing to drink would have too strong a flavor for the dish.) I was left with a few options, and settled on chunky kernel spread, which I keep wanting to call chunky kernel dip, because really it is a dip. 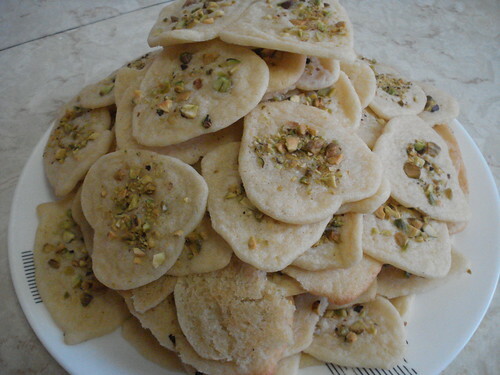 This is one of the easier recipes of an elementary lot. 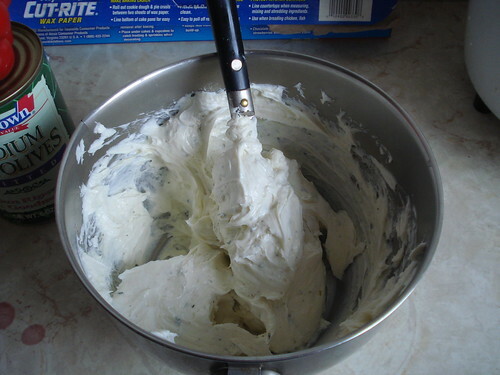 I allowed two packets of reduced-fat cream cheese to soften (the recipe called for fat-free, but you can’t really find fat-free anything in our local stores), then mixed in a packet of Hidden Valley Ranch dressing mix. 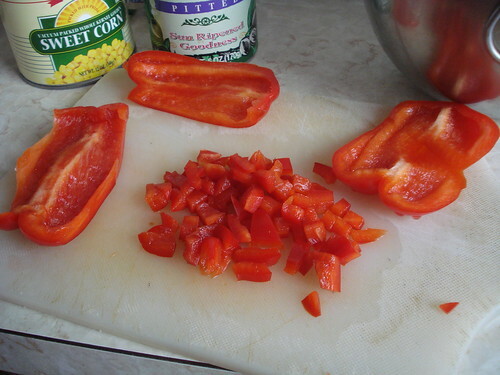 The recipe directed me to then add an 11-ounce can of corn (drained), a 5-ounce can of sliced black olives (drained), a 4-ounce jar of chopped mild green chiles (also drained), and a small red bell pepper (diced). I could only find 12-ounce cans of corn, and chose not to worry about the difference. I could also only find cans of whole black olives, so bought a can and sliced up enough to equal the canned amount. And I found only cans of chiles, not jars. I thought I had pulled a can of chopped chiles but discovered when I opened it that I had once again fallen prey to grocery shelf dyslexia and purchased whole chiles, so I chopped those up as well. 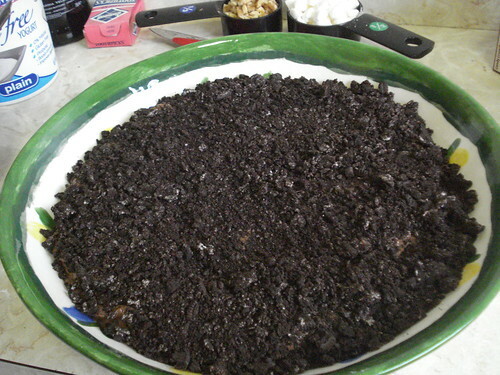 I stirred everything together, covered the bowl with plastic wrap, and stuck it in the fridge for a little over an hour. 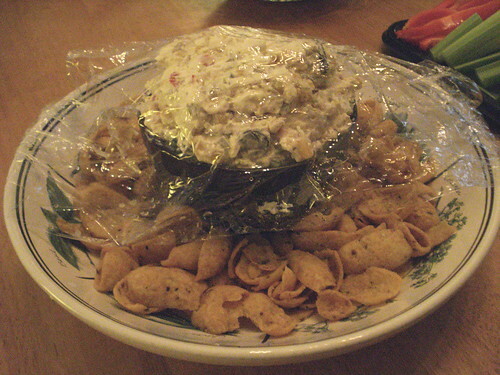 Closer to party time, I pulled out the dip and put it into a bowl, which I set in a serving dish and surrounded with Fritos (as per the recipe). I found the dip underwhelming when I sampled some off the spoon, but it turns out that Fritos were required for a reason: the high level of salt and the strong corn flavor tie together the flavors in the dip, and make it a pretty satisfying snack. Verdict: Success. 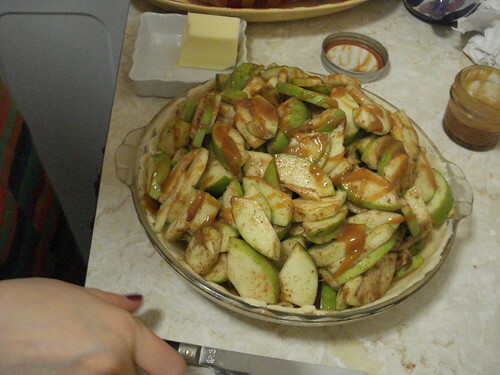 I can’t see myself making this again any time soon; it seems like it would go best with a sports-watching party, and I don’t really watch sports. Puppy Bowl, maybe? 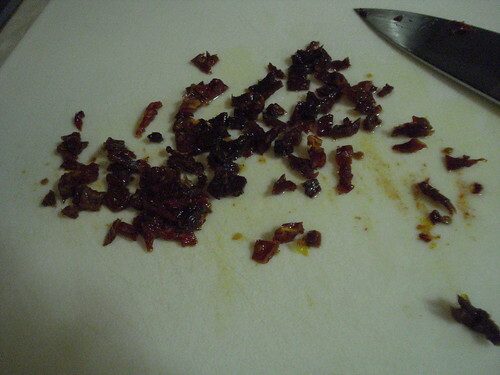 If I do make it again I’ll use hotter chiles and kalamata olives, and buy more Fritos. I have never been a fan of Jell-O. 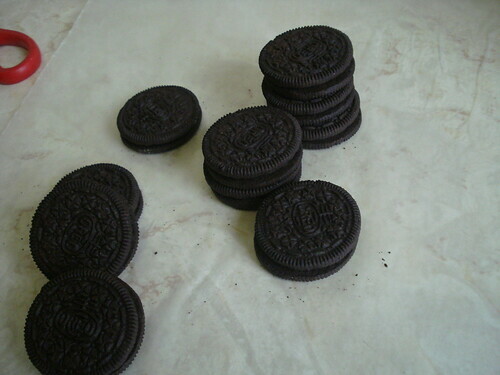 I find the texture off-putting, the taste chemical-y and harsh, and the very principle simply wrong. 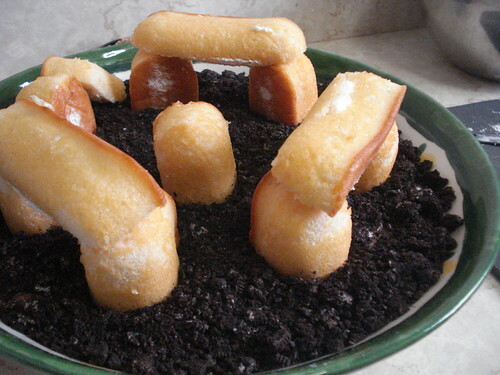 This is probably one reason that I own three Jell-O cookbooks; in fact, it was a Jell-O cookbook that started me down the path to Recipes of the Damned, and eventually to this blog. The New Joys of Jell-O is not that cookbook. The New Joys of Jell-O is a slim hardcover published in 1973 and resplendent with early 1970s glory; lurid color photos display outmoded hairstyles, clothing and Jell-O dishes. The publisher is clearly trying to pull Jell-O out of a 1960s cultural tar pit by showing that hip, groovy people who are in touch with today’s modern world will show up on your doorstep carrying fruit encased in translucent goo. 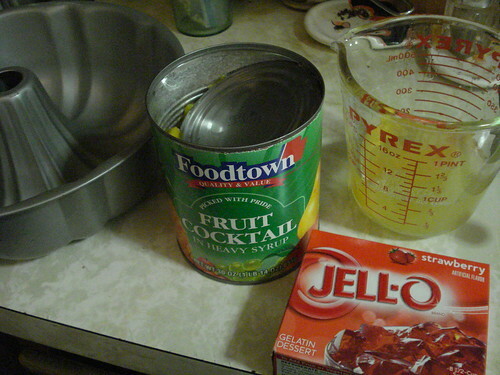 The last time I made a Jell-O recipe I played it safe, adding melon balls to lime Jell-O and leaving it at that. This time I decided that I really had to go big. Big and bad, as it happened. 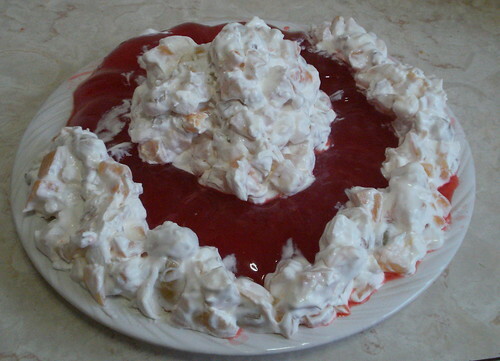 So I scanned the recipes for something that would encapsulate all the worst aspects of Jell-O cookery — no small selection of choices — and settled on ring around the fruit mold. 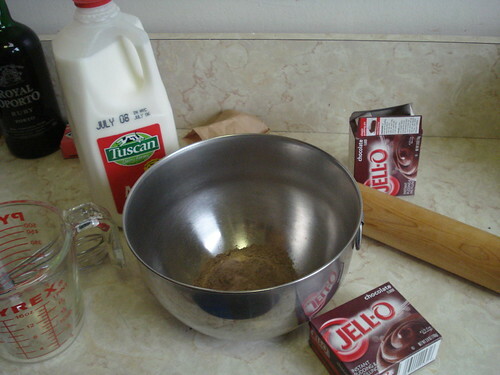 I began by making the Jell-O itself. Following the recipe’s instructions, I drained the liquid from a 30-ounce can of fruit cocktail, and added water to it to make 1 1/2 cups. I set this aside, possibly not as far as I should have. 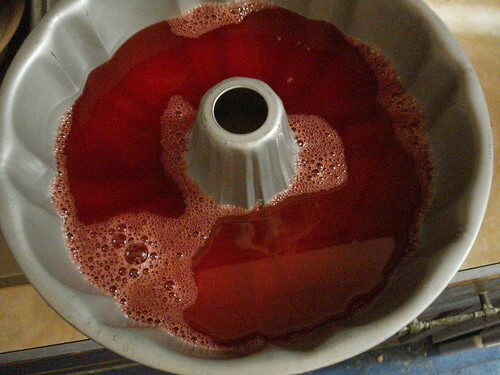 I dissolved a 6-ounce packet of strawberry Jell-O in 2 cups of boiling water, stirred in the fruit cocktail solution, and poured the liquid into a Bundt pan. This represented my first real sign that things weren’t going to go quite as hoped. 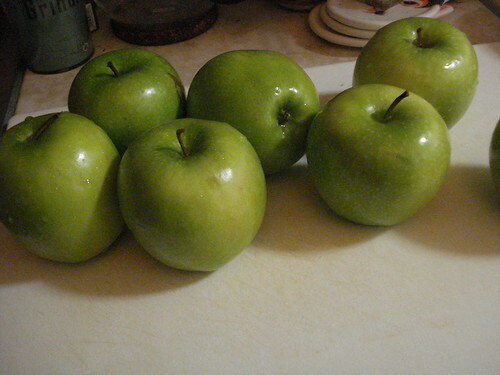 (Well, first real sign after the realization that I was making Jell-O in the first place.) 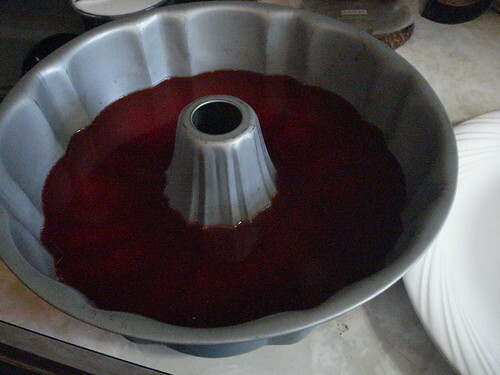 I don’t own any actual Jell-O molds, and I didn’t have anything at all ring-shaped other than my standard Bundt pan, and it’s about twice the size I needed. I worried a little about whether the Jell-O would unmold cleanly, then decided there wasn’t anything I could do about it at this point, and put the pan in the fridge to chill overnight. 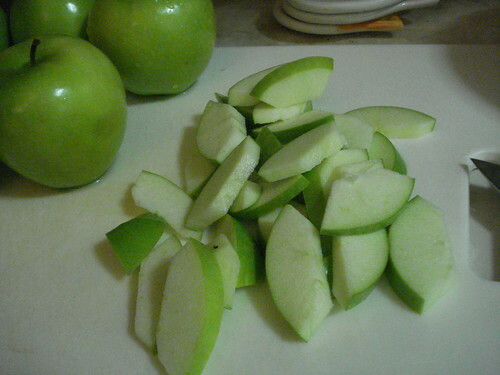 The next step was to assemble the fruit component. 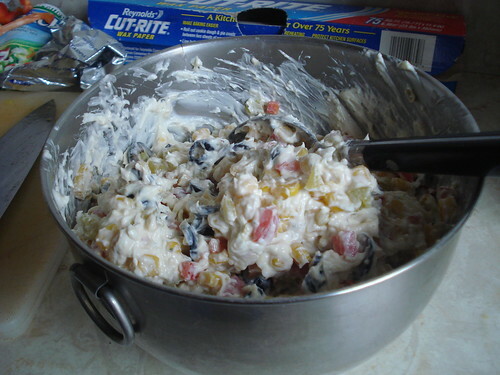 The recipe called for 1 cup of prepared Dream Whip, 1/3 cup of chopped nuts, 1/2 cup miniature marshmallows, and the fruit from that can of fruit cocktail. You can see already this isn’t going anywhere good. 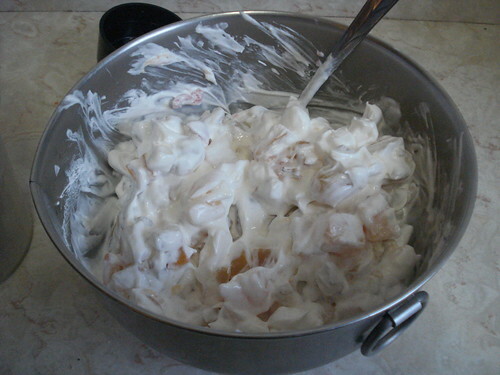 I’ll reassure you on one point, though: Dream Whip is (or perhaps was) the mix-it-yourself equivalent of Cool Whip. (It is not salad dressing; that’s Miracle Whip. Breathe a sigh of relief.) I don’t know if Dream Whip is available for sale today, but it certainly can’t be found in my neighborhood grocery store, so I substituted Cool Whip. 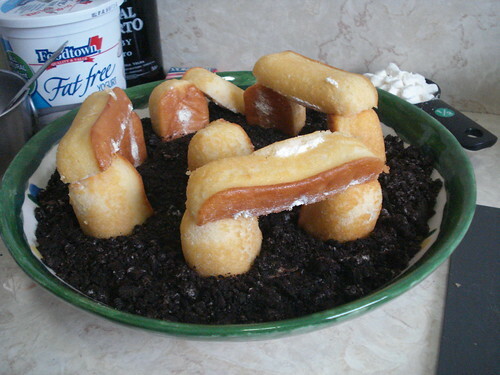 The marshmallows were also a problem, because they didn’t have miniatures at FoodTown. I couldn’t be sure from the shelves if they were sold out or if they just weren’t available. I considered trying the other grocery stores in the area, but I decided against that. It’s been insanely hot here, and I didn’t feel like trooping from store to store. I also wasn’t confident that I’d find them anywhere else; after all, who runs out of or doesn’t stock miniature marshmallows? It wouldn’t be the first time that I’d gone store to store only to discover that nobody carries something that I had just assumed everybody would have in stock. And I had a party to prepare for; I didn’t really want to spend the time, especially if it wasn’t going to come to anything. 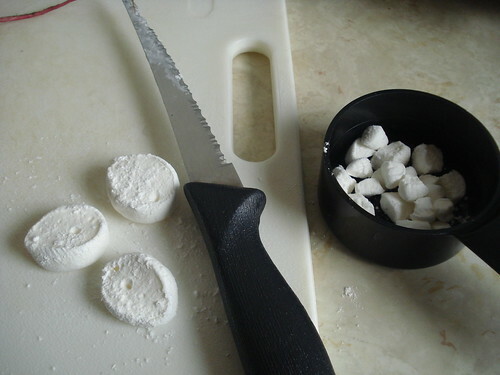 So I bought full-size marshmallows and decided to chop them into bits. 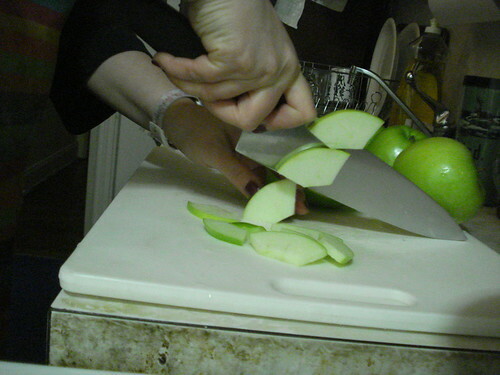 This was tricky, because marshmallows are gummy and sticky inside and really want to stick to your knife. 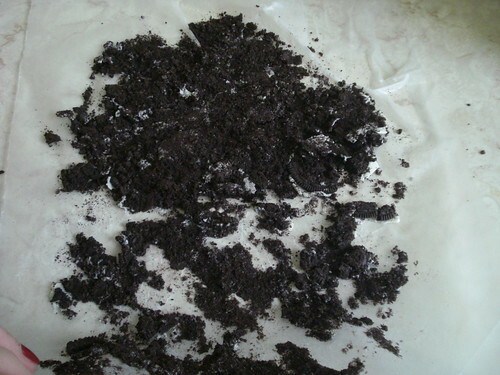 I dusted my knife blade with powered sugar and dipped the exposed surfaces in powdered sugar as I went along, and while this didn’t completely solve the stickiness problem, it reduced it enough that I could accumulate half a cup of marshmallow bits without completely losing it. 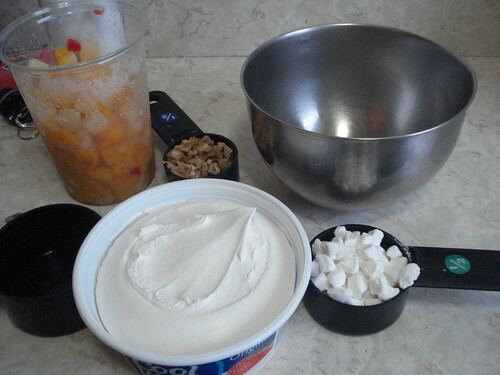 My sourcing problems addressed, I mixed together the Cool Whip, fruit cocktail bits, marshmallows and chopped walnuts. 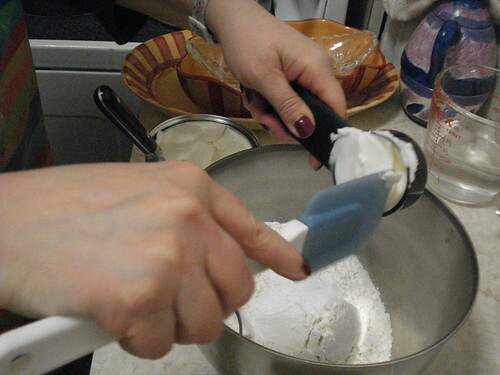 The mixture was pale and lumpy and distinctly unencouraging. I set it aside and prepared to unmold my Jell-O. 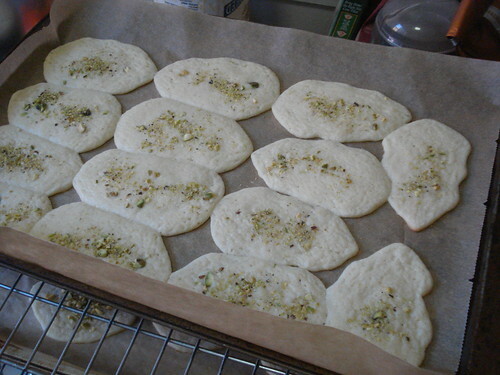 I turned it onto a plate and it came out in once piece–a misshapen piece that was liquidy at the edges. I think I may have held the mold in warm water a little too long; I was afraid I’d mixed in too much liquid (package directions say no) or used boiling water when I should not have (package directions say boiling water, no problem there) or failed to let it chill long enough. 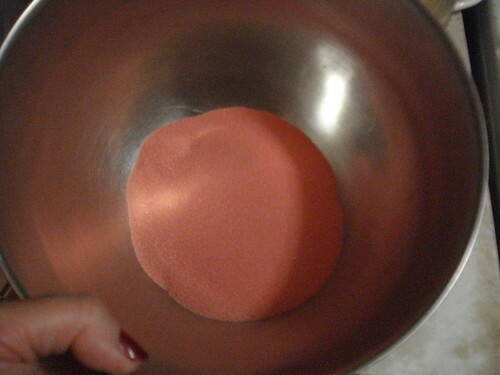 But it didn’t continue to bleed liquid, so I think I just warmed the pan too much. 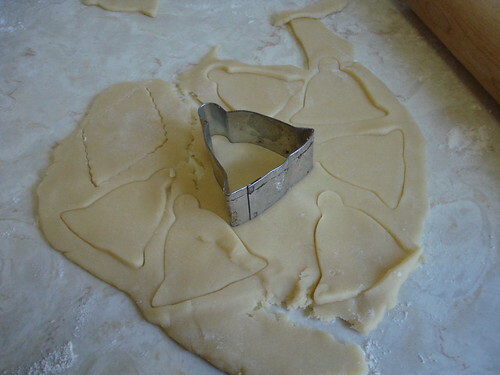 Certainly once I’d turned it out into a cockeyed triangle, it didn’t remain malleable enough for me to shape it back into a ring. 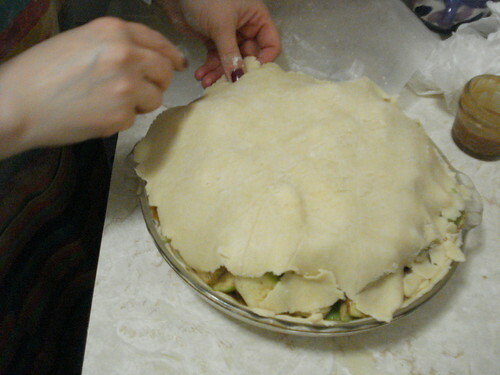 I began to spoon the fruit cocktail mixture into the center. 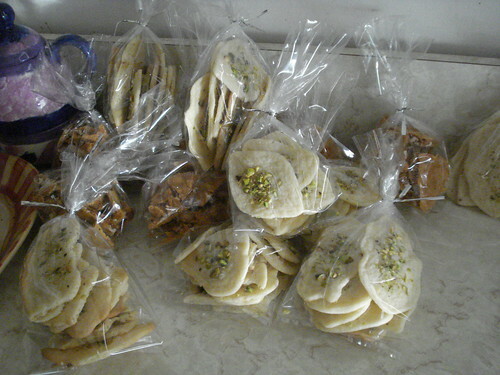 There was a lot of it. Frankly, I think there was too much of it. For the amount of fruit cocktail mixture I had I think I needed twice the Jell-O. 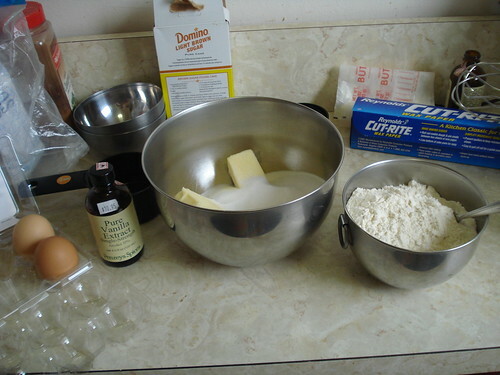 (It had occurred to me the night before, when I saw that the Bundt pan was only half full, that I might go get more Jell-O and make a double quantity. 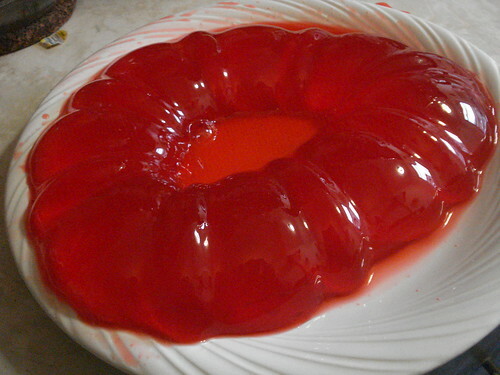 But then it occurred to me that I would have that much more Jell-O left over, because I had no illusions that the party guests were going to flock to the Jell-O mold and clamor to take some home with them. So I didn’t.) I spooned in as much as I felt I could reasonably keep on the plate without in fact hiding the Jell-O, and carried the dish out to the party buffet. Quite a bit later, after we’d enjoyed salad and dips and pickles and cake and whiskey (more on that in another post), Scott decided it was time to find out how the Jell-O was. 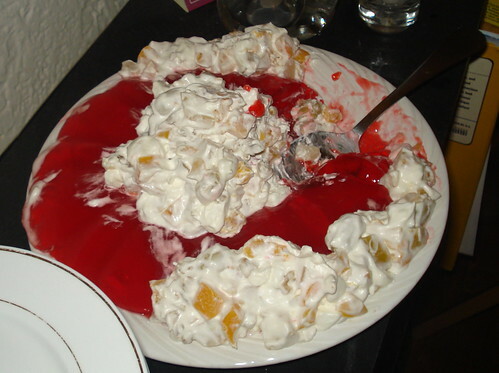 He served himself a plate with even shares of Jell-O and fruit cocktail mixture, took a bite, and furrowed his brows. 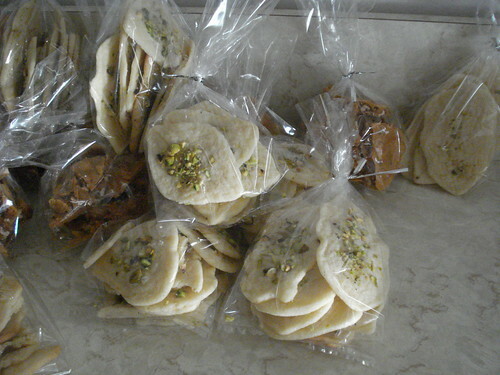 “You have to eat some of this,” he said, in a tone that implied “It’s your fault we even have this here.” He served some out for me before I could protest, though I agreed that it was my fault and it was only fair that I tried it for myself. The Jell-O was the best part of it. This is not a compliment. 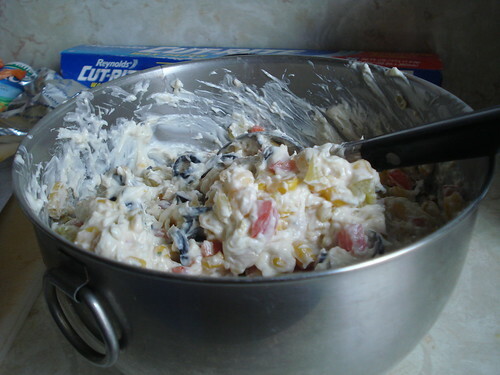 The combination of Cool Whip and fruit cocktail and marshmallows was unpleasant, even more than I had expected. 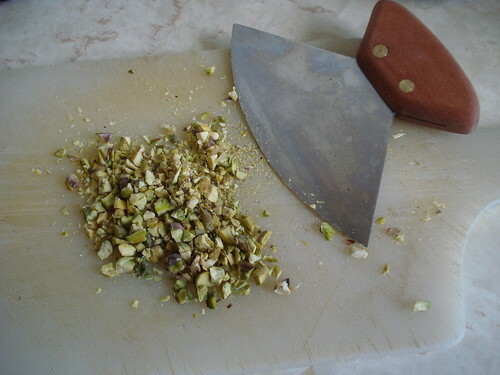 (The nuts did nothing to improve or degrade it, really.) The flavors and textures were completely discordant. 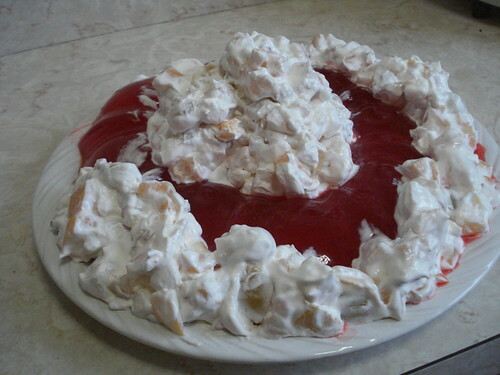 There was the slipperiness and chemical tang of Jell-O, the sticky softness of marshmallow, and the mushy so-very-not-fresh-fruit sensation of the fruit cocktail pieces. I finished the serving because I kept thinking one of these spoonfuls was bound to improve, but they never did. The apartment was really warm, but the Jell-O held up surprisingly well, and didn’t start to melt off the plate for some hours. 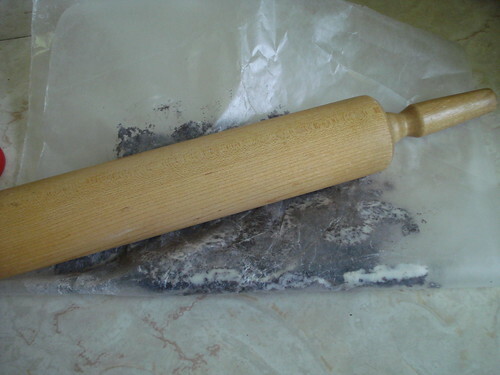 Once it did, I took it out to the kitchen and disposed of it. Verdict: Disgusting. Kids, don’t try this at home. I have no idea where we got this, whether it was a gift or a discount bin purchase or a throw-in-with-an-online-order acquisition, but here it is. 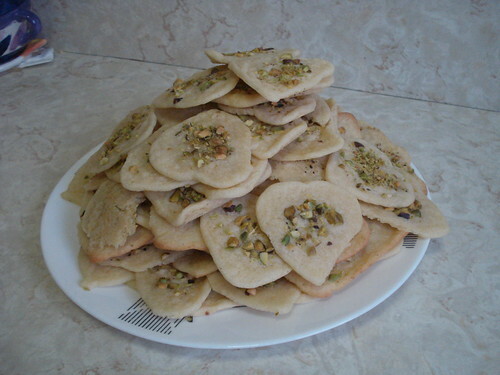 It’s loaded with appealing appetizers, entrees, even desserts. 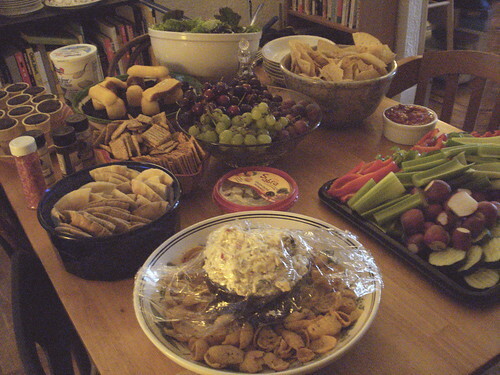 I quickly found garlic goat cheese spread and was ready to go. 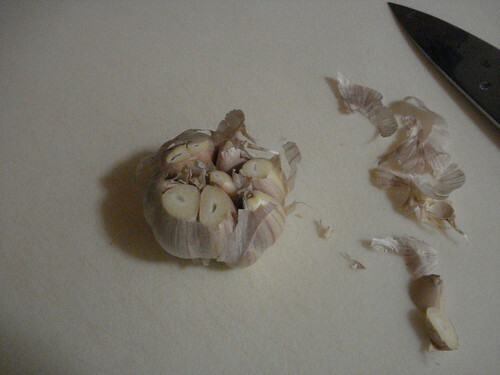 I began with the garlic: one head, top trimmed off, drizzled with a little bit of olive oil from a jar of sun-dried tomatoes. 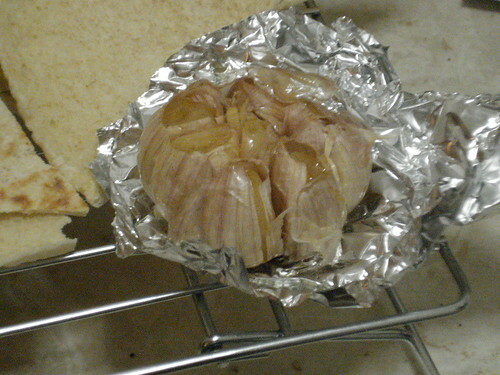 I wrapped the head in foil and put it into a 350-degree oven for an hour, then pulled it out, unwrapped the foil, and let it sit until it was cool enough to handle. At this point I stirred in about 11 ounces of goat cheese. 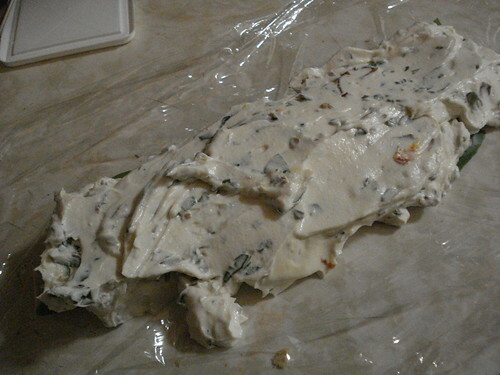 I used the Chevre brand spread, the last two little containers that were on the shelf at the grocery store, but I think just about any basic goat cheese would serve. 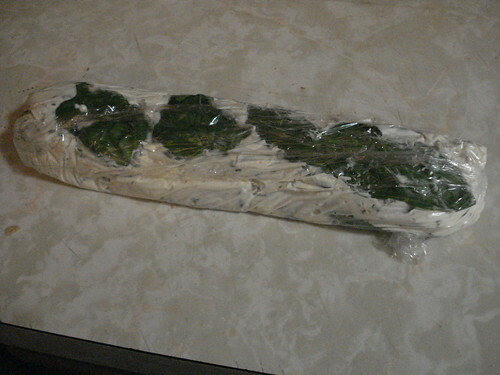 Once I’d thoroughly mixed it all together, I laid four whole basil leaves on a sheet of plastic wrap, spread the goat cheese mixture over them, laid on four more basil leaves, and rolled the plastic around to shape the cheese into a little log. It went into the fridge, and the idea was that after an overnight chilling it would be stiff enough to slice into rounds. It was not. It was still soft and spreadable in the morning, and I knew that once I got it to Central Park there would be no chance of chilling and slicing. 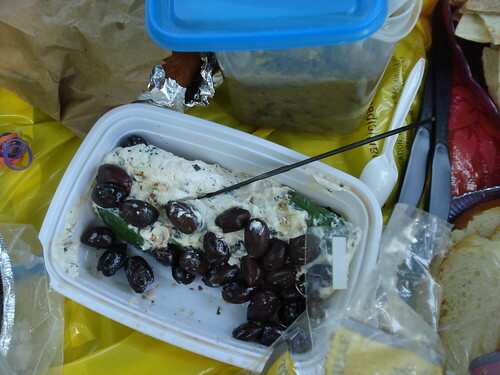 So I removed the plastic and laid the cheese in a container with some kalamata olives. At the picnic I offered it up with slices of baguette, and it was very well received. The picnickers went through a good proportion of it, though what was left at the end of the day was decidedly the worse for wear. Verdict: Success. 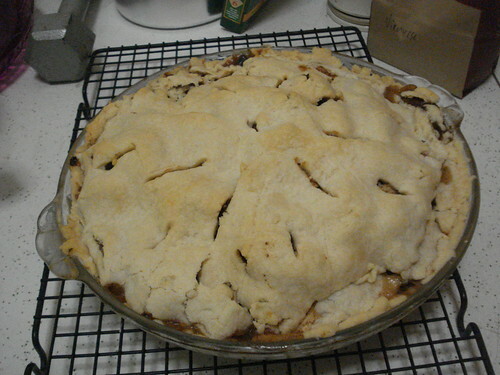 I’ll do it again, when it cools down enough to turn on the oven. 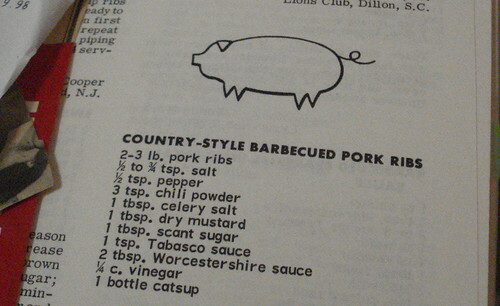 A Lion in the Kitchen is a 1965 Lions club recipe compilation. I don’t know if there were other volumes, but this one focuses on meat, and boy, are there a lot of meat dishes included. 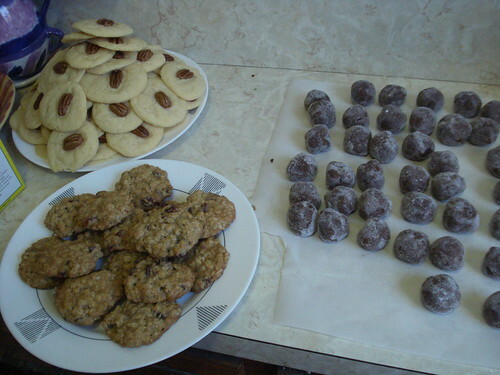 Wild game, beef roasts, sandwiches, stews, grill preparations, and even a few silly recipes (such as “How to Cook a Husband”), all adding up to a lot of calories and cholesterol. “This is a man-sized dish, the kind males go for,” say the notes to one recipe, one of the innumerable ground-meat casseroles included — though it could be said of nearly anything in the book. The titles make for entertaining reading. Squirrel supreme, Hoosier beef casserole, tuna mound, green turtle steak saute, “my wife is visiting her mother casserole.”¬† Goofy little cartoons dot the pages, and unappetizing black and white photos mark the chapter introductions. One of the best parts of this book is that a previous owner left little recipe clippings between many of the pages, and also wrote little comments. He or she seems to have been very interested in beef roasts and casseroles. It took me a while to settle on something to try. I didn’t want to make beef or chicken again, but I also didn’t want organ meats. Scott avoids shrimp to keep from exacerbating his gout. 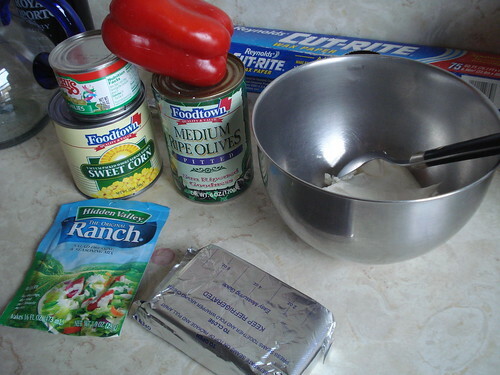 I didn’t want to make anything that called for canned soup or powdered soup mix, which constraint itself ruled out a pretty large proportion of the recipes. 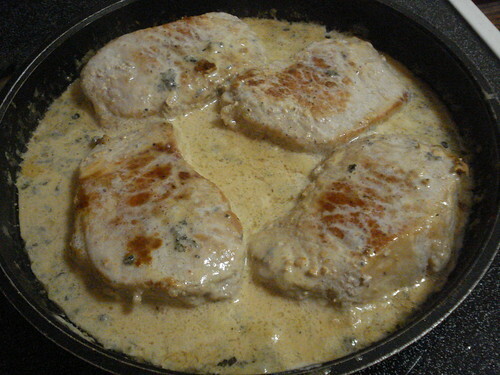 I also didn’t want to buy several pounds of roast, or try anything with unfindable or unexplained ingredients, such as “1 8-oz can of Arturo sauce.” But eventually I settled on a pork chop dish that featured Roquefort cheese in a cream sauce — not exactly lean, but at least straightforward to prepare. 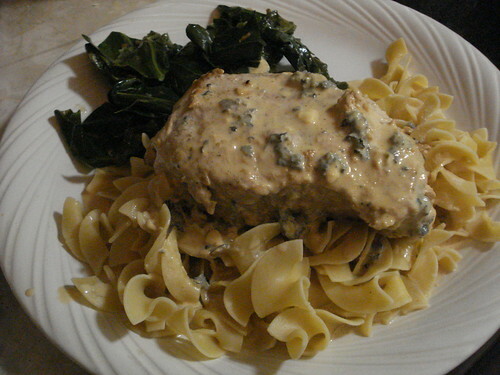 I began by seasoning four pork chops with salt and pepper and browning them on both sides in some canola oil, about 15 minutes per side; while they cooked, I chopped up collard greens and garlic for a side dish, started water boiling for noodles, and chopped up a wedge of Roquefort cheese. 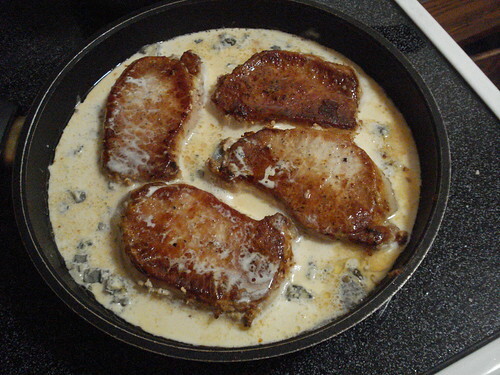 When the pork chops had browned well on both sides, I poured in a cup of heavy cream and added the cheese; I then covered the pan and let the cream and cheese cook with the pork chops. 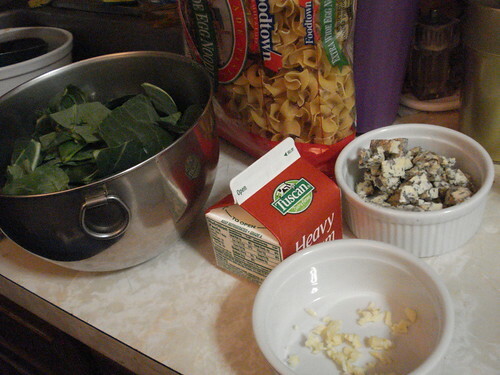 In the meantime I cooked egg noodles and made the collard greens. The cheese and chops cooked together for about 15 minutes. I topped noodles with a pork chop and cheese sauce, with the collard greens on the side. 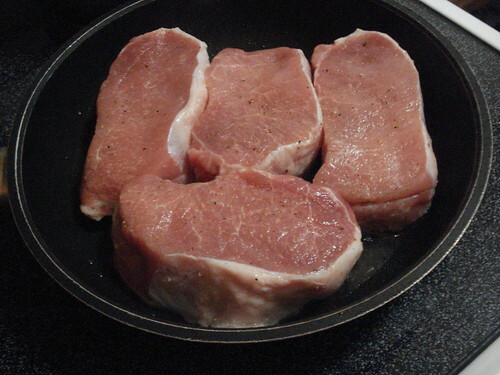 The pork chops tasted great. 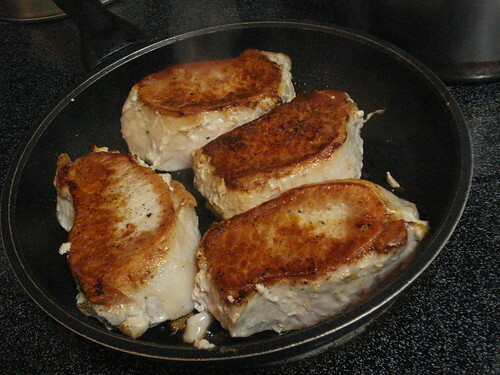 I thought they were just a slight bit overcooked; probably I should have cut a couple of minutes from each phase of cooking, since today’s pork cuts have less fat than those available in the 1960s. But they were tasty, and the sauce brought together the noodles and the pork very well. Verdict: Success. I doubt I’ll be using this cookbook again very soon, but tonight’s dinner was great. Pepper Springs Cookbook barely makes it into the list of my holdings that qualify as cookbooks. 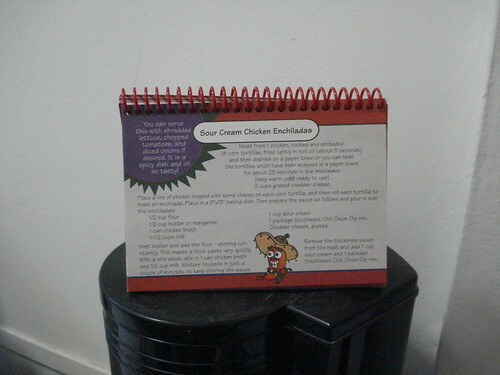 It’s a little wirebound booklet with a rigid back that stands up to display the recipe of choice, and all the recipes rely on sauce or flavor mixes sold by the company. We got it in a holiday gift box from Dale and Peggy (Scott’s brother and his wife), and when I started looking for a recipe to use from this book I had to double-check that we still had any of the mixes left that were included in the package. 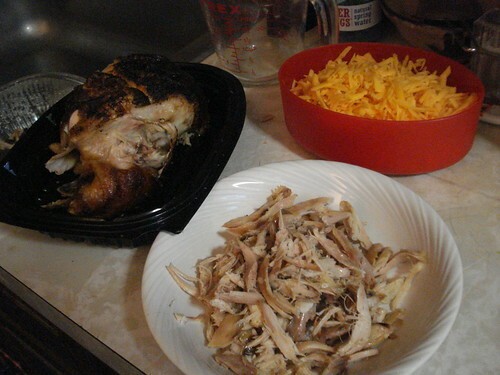 I began with a rotisserie chicken (Southwest flavor, why not? 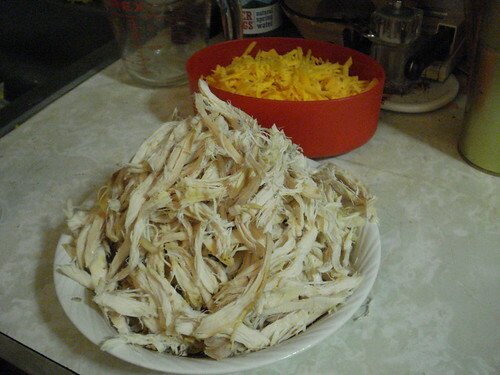 ), which I shredded apart — a time-consuming and greasy task to be sure, but less overall effort than roasting your own. Once that was done and I’d grated some cheese, I followed the directions for preparing the corn tortillas for filling: “heat the tortillas which have been wrapped in a paper towel for about 25 seconds in a microwave.” These turned out not to be the ideal instructions for my particular tortillas. 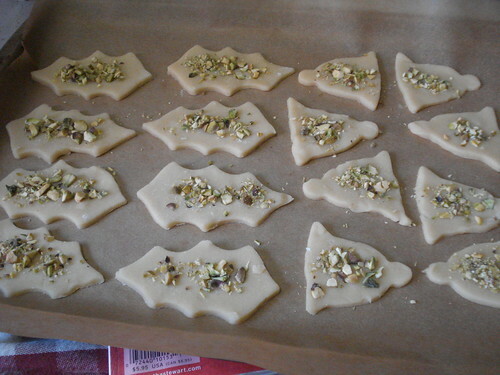 It’s possible the ones I was working with were too stiff, or started from too cold a temperature, but the 25 seconds in the microwave did not sufficiently soften them to roll and stay rolled. The first one broke as I was putting it into the pan; the next one unfurled, distributing chicken and cheese around the pan. 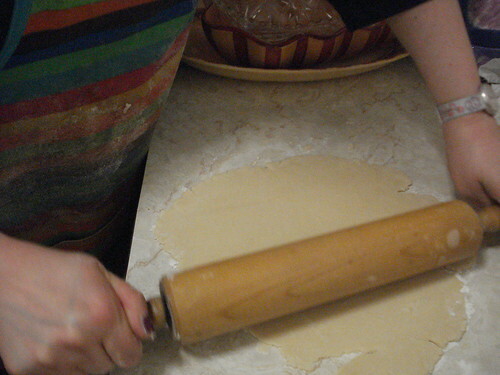 I reheated the remaining tortillas periodically but it was no use; I had to hold rolled enchiladas against the side of the pan with one hand and work single-handed to fill the others until I’d arrayed enough to stay reasonably close to their rolled form when I let go. 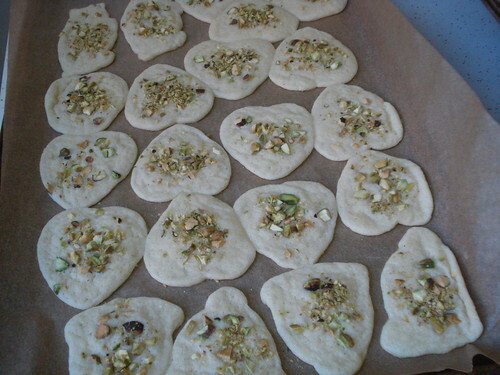 And as they cooled, all of them ruptured. By the time I was done, the pan looked like it held some perverse variant on soft tacos. Maybe I needed a tortilla that was more initially pliable; I’d say mine were typical of supermarket corn tortillas, but perhaps I should lay hands on the ones featured on the cover of the newest issue of Edible Queens. Or maybe I should have soaked the tortillas briefly in chicken broth or milk. 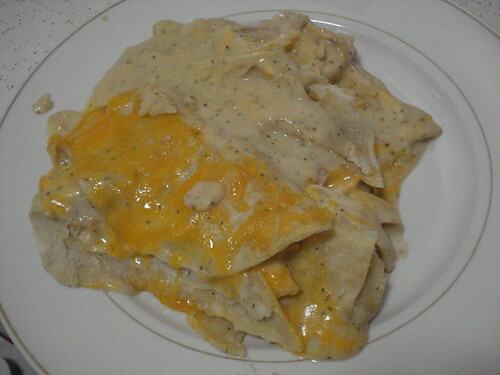 Too late now; my enchiladas had become enchilada casserole. 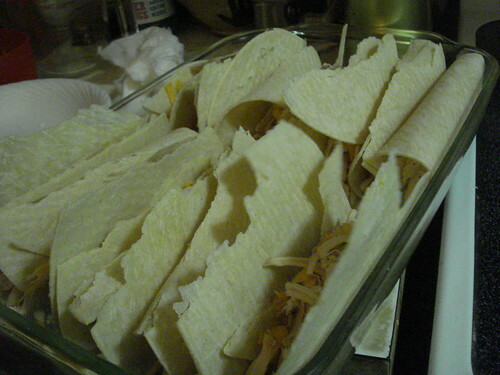 Anyway, what one is supposed to do is fill each tortilla with shredded chicken and grated cheddar, roll it up, and lay it in a baking pan. 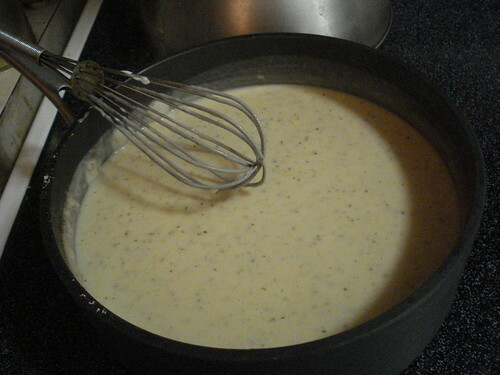 I sighed and moved on to the sauce, which was a fairly simple white sauce base. 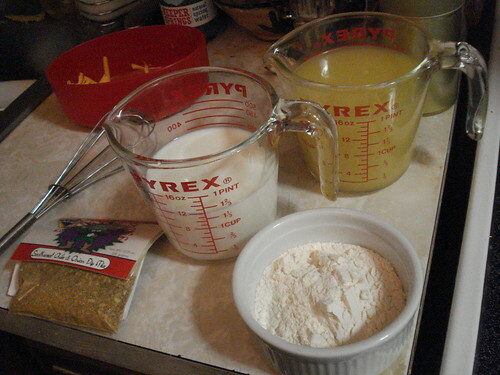 I made a roux with a melted stick of butter and half a cup of flour, then whisked in half a cup of milk and two cups of chicken broth (the booklet says a can, but everything I could find was in aseptic quart packages). I noticed here that the recipe had listed 1-1/2 cups of milk in the ingredients but directed me to stir in half a cup, and nowhere did it say what to do with the remaining cup. So I eyeballed the baking pan and the liquid currently cooking up for sauce, and added the rest of the milk to the pot. 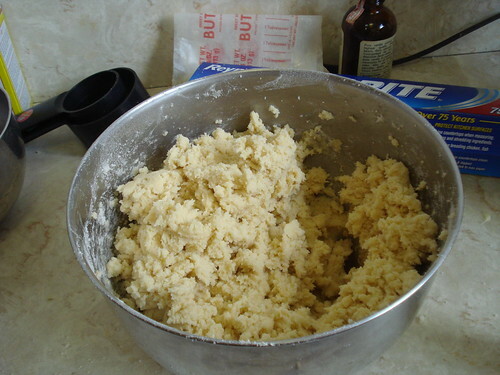 I stirred constantly until the mixture began to thicken (not all that long; there was a pretty high ratio of roux to liquid here), then removed the pan from the heat and stirred in a packet of Pepper Springs Southwest Chili & Onion Dip mix and a cup of sour cream. The sauce smelled great. 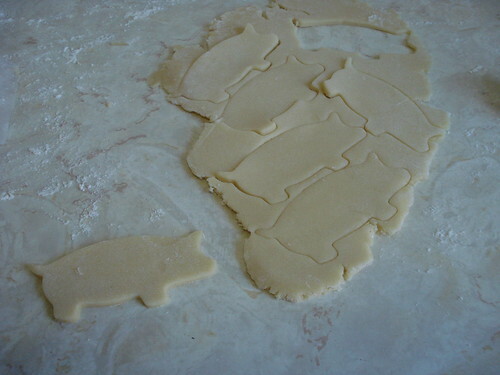 And this is where the recipe ends. 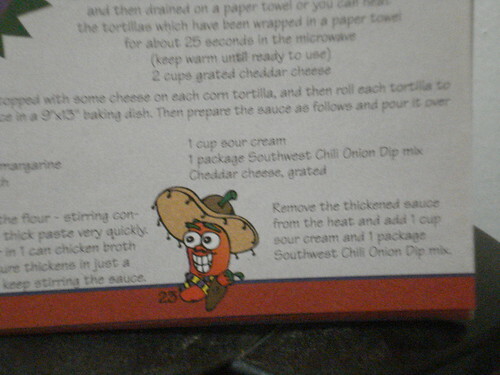 The first half of the page concludes with “prepare the sauce as follows and pour it over the enchiladas.” The page itself ends with instructions to stir the dip mix and sour cream into the sauce. Nowhere does it say whether to bake the enchiladas, or at what temperature. 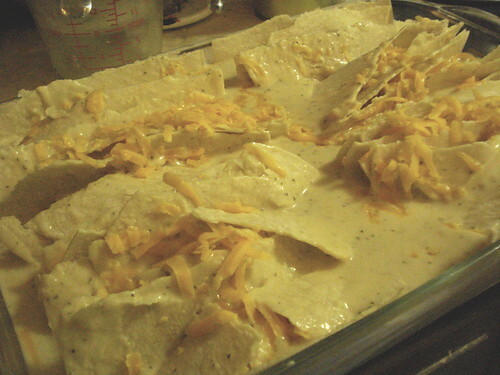 Now, it is possible that the intention was for the enchiladas to be complete at this stage, and for the cook to pour on the sauce, then dish up supper immediately. I’m not sure I’ve ever seen an enchilada recipe that did not call for baking, but it doesn’t seem impossible. However, when I considered the previous issue of the wayward cup of milk, I decided that it was more likely the baking instructions had simply been omitted. 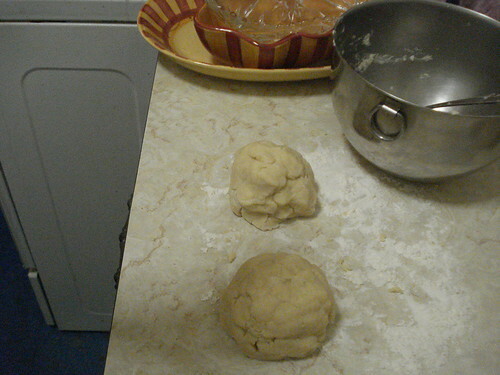 Regardless, my shattered corn tortillas were not yet ready to eat. 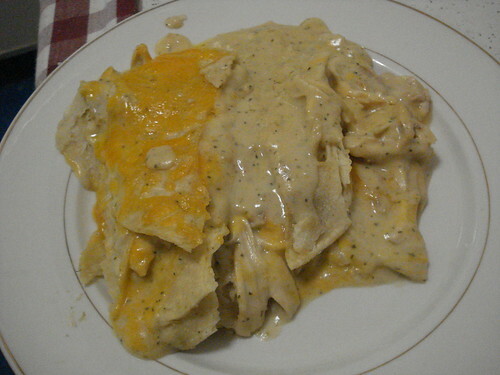 So I preheated the oven to 375, poured the sauce over the fragmented enchiladas, and baked the casserole for 20 minutes, which seemed to bring the tortillas to a satisfactory consistency. This is something that bothers me about little throwaway cookbooks like this. 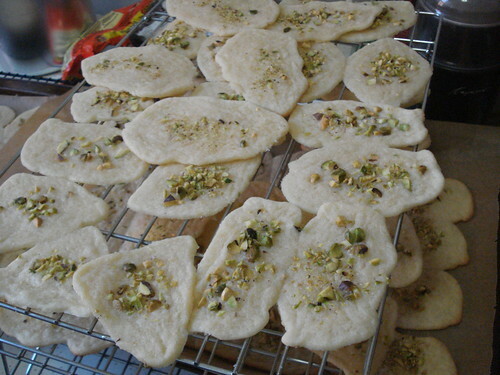 They’re intended for the inexperienced cook, the one relying on mixes and processed ingredients, but all too often they are shoddily edited. Of course as an editor I’m always annoyed to see a published work that hasn’t been edited properly, but it’s particularly galling in a cookbook for inexperienced cooks because they are less likely to have the fundamental skills to solve the problems that the editing mistakes cause. Well, rant mode off. 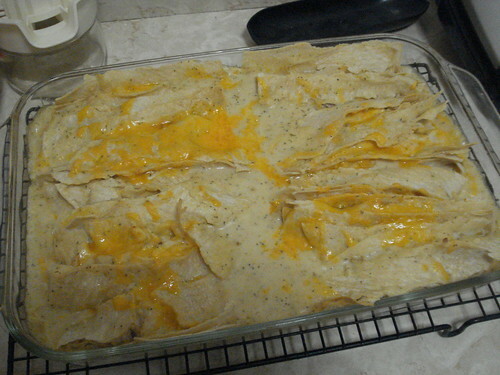 The baked enchiladas tasted good; while not pretty, they had a nice spicy flavor that helped keep the sour cream sauce from being too heavy. Verdict: Not quite as expected, but satisfactory. 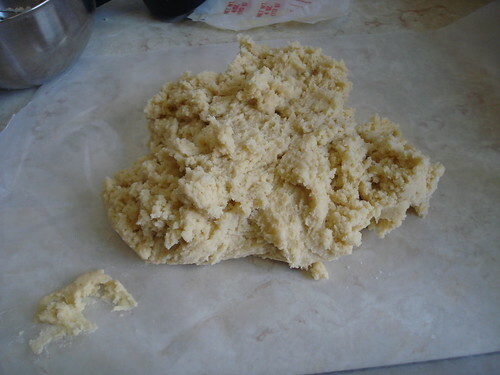 But a good illustration of why I don’t like to rely on processed mixes too much. Food & Wine Fast is another of those special stand-alone editions of a magazine. This one offers elegant dishes of the quality often found in Food & Wine, all of which can be prepared in 30 minutes or less. I do like Food & Wine; the recipes all feature real, high-quality ingredients, and the photo spreads are glorious. 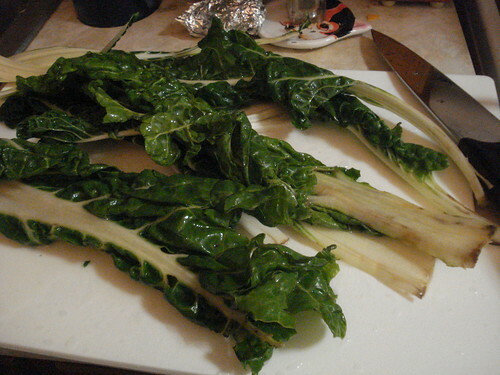 I designated this recipe for tonight simply because I hadn’t been able to pick up Swiss chard any earlier in the week, but it turned out to be a good choice because I spent a big chunk of time in the kitchen baking cookies for tomorrow’s knitting night, and I didn’t want to spend more time on dinner than I had to. 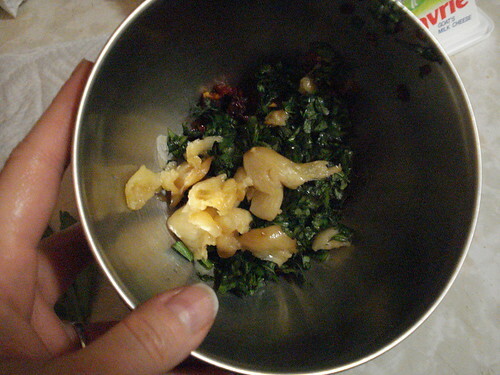 I began by rinsing and stemming some Swiss chard and putting the still-dripping leaves into a pot (in fact, the new Calphalon pot I got with a gift certificate recently). 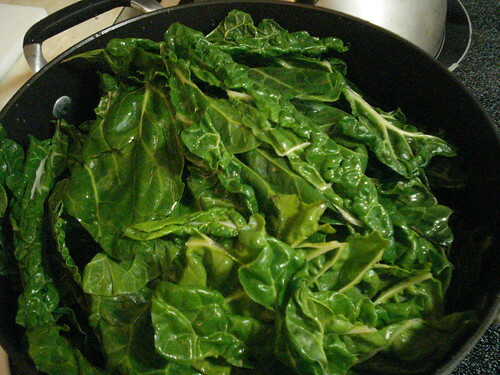 I covered the pot and cooked the leaves until they were wilted, which took less than five minutes; then I drained the chard and rinsed it in cold water, and pressed out as much liquid as I could. 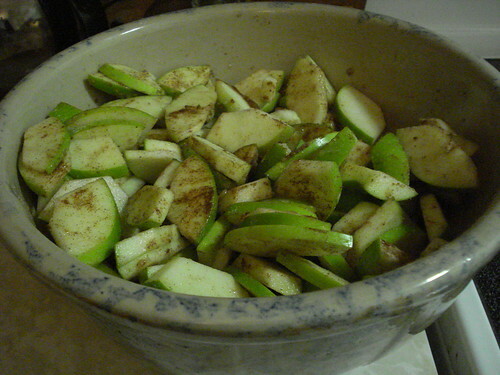 I chopped the leaves coarsely and put them into a bowl. 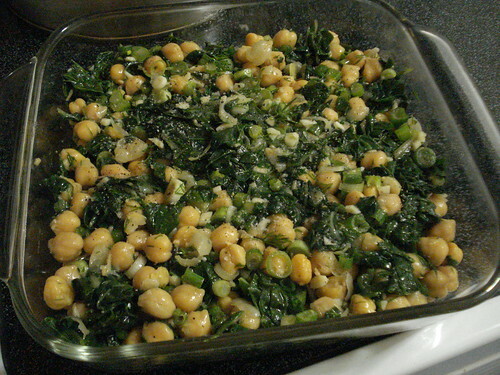 To this I added sliced scallions, chopped fresh dill, minced garlic, chickpeas, salt and pepper, and some olive oil. 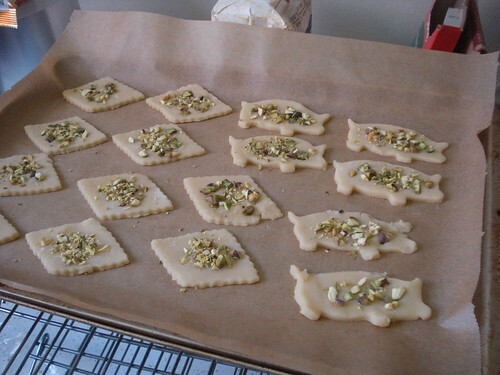 I mixed the ingredients well and put them into a square baking dish that I’d coated with a bit more olive oil. 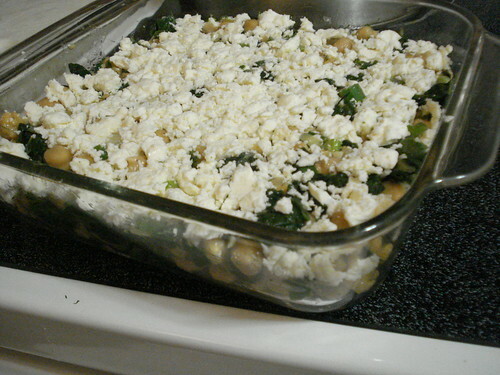 Atop all this I crumbled some feta cheese and pressed it down a bit, then put the dish into a 400-degree oven for about 20 minutes, which gave me some time to clean up the kitchen. 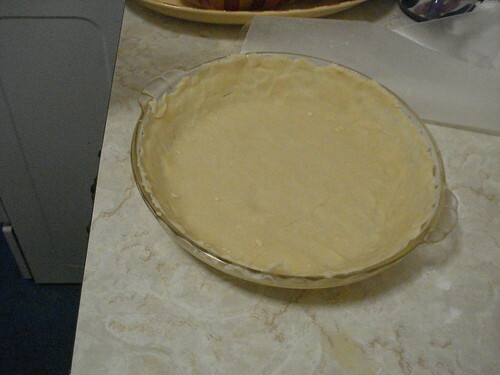 The cheese had browned a bit at the edges when I pulled out the pan, and the mixture was hot through. I dished it up and accompanied it with some bread left over from Sunday. 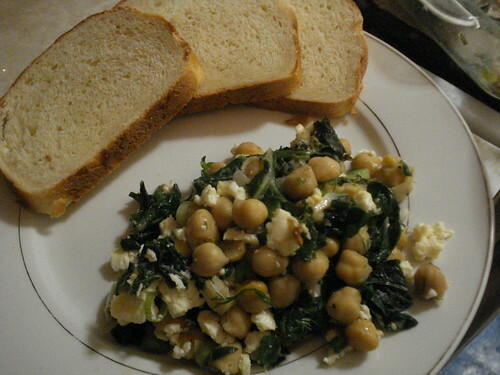 The dish was terrific; the dill gave it an unusual savory flavor, and the slight tang of the chard balanced nicely with the richness of the feta. Verdict: Success. The dish was fast, as promised, and tasted great.